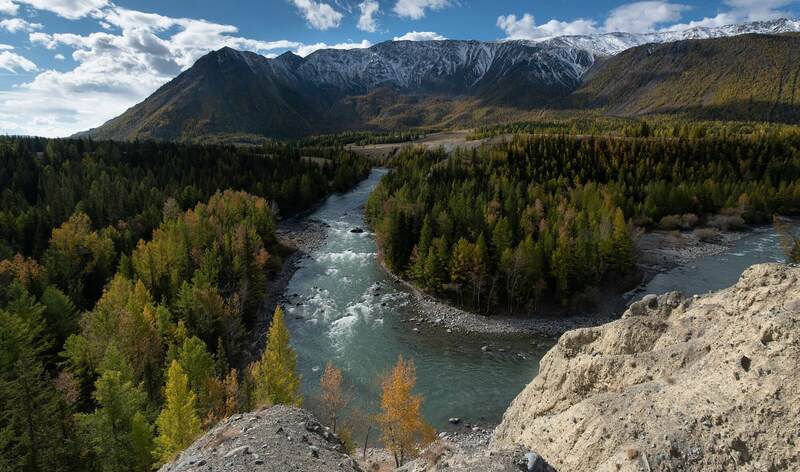 The Altai Mountains (/ɑːlˈtaɪ/; also spelled Altay Mountains; Altay: Алтай туулар, Altay tuular; Mongolian: ᠠᠯᠲᠠᠢ‍ᠶᠢᠨ ᠨᠢᠷᠤᠭᠤ, Altai-yin niruɣu (Chakhar) or Алтайн нуруу, Altain nuruu (Khalkha); Kazakh: Алтай таулары, Altai’ tay’lary, التاي تاۋلارى‎; Russian: Алтайские горы, Altajskije gory; Chinese: 阿尔泰山脉, Ā'ěrtài Shānmài, Xiao'erjing: اَعَرتَىْ شًامَىْ‎; Dungan: Артэ Шанмэ) are a mountain range in Central and East Asia, where Russia, China, Mongolia, and Kazakhstan come together, and are where the rivers Irtysh and Ob have their headwaters. The northwest end of the range is at 52° N and between 84° and 90° E (where it merges with the Sayan Mountains to the east), and extends southeast from there to about 45° N and 99° E, where it gradually becomes lower and merges into the high plateau of the Gobi Desert. Lake Baikal (Russian: о́зеро Байка́л, tr. Ozero Baykal; IPA: [ˈozʲɪrə bɐjˈkɑl]; Buryat: Байгал нуур, Mongolian: Байгал нуур, Baygal nuur, etymologically meaning, in Turkic, "the rich lake") is a rift lake in Russia, located in southern Siberia, between Irkutsk Oblast to the northwest and the Buryat Republic to the southeast. Lake Baikal is the largest (by volume) freshwater lake in the world, containing roughly 20% of the world's unfrozen surface fresh water. With a maximum depth of 1,642 m (5,387 ft), Baikal is the world's deepest lake. It is considered among the world's clearest lakes and is considered the world's oldest lake — at 25 million years. It is the seventh-largest lake in the world by surface area. With 23,615.39 km3 (5,700 cu mi) of fresh water, it contains more water than all the North American Great Lakes combined. 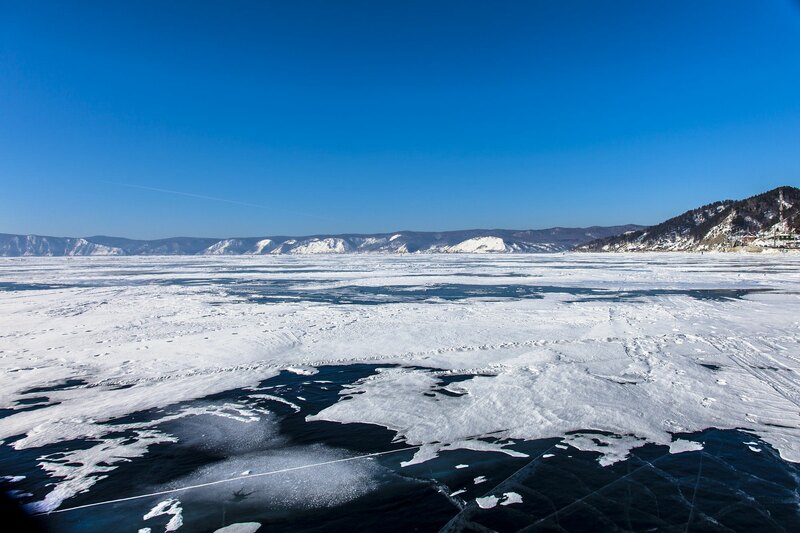 Like Lake Tanganyika, Lake Baikal was formed as an ancient rift valley, having the typical long crescent shape with a surface area of 31,722 km2 (12,248 sq mi). Baikal is home to more than 1,700 species of plants and animals, two-thirds of which can be found nowhere else in the world. The lake was declared a UNESCO World Heritage Site in 1996. It is also home to Buryat tribes who reside on the eastern side of Lake Baikal, rearing goats, camels, cattle, and sheep, where the mean temperature varies from a winter minimum of −19 °C (−2 °F) to a summer maximum of 14 °C (57 °F). The Karelsky Coast (Russian: Карельский берег) is a coastal area in Murmansk Oblast and the Republic of Karelia in northwest Russia. It is located on the western side of the White Sea, between Kandalaksha and Kem. The major rivers flowing to the sea at the coast are the Kovda and the Kem. Administratively, the Karelsky Coast is shared between Kandalakshsky District of Murmansk Oblast and Kemsky and Loukhsky Districts of the Republic of Karelia. Inhabited localities such as Kovda, Beloye More, Lesozavodsky, Kem are all located at the Karelsky Coast. The coast has been populated by Pomors and Karelians since no later than the 13th century. Koryaksky or Koryakskaya Sopka (Russian: Коря́кская со́пка) is an active volcano on the Kamchatka Peninsula in the Russian Far East. It lies within sight of Kamchatka Krai's administrative center, Petropavlovsk-Kamchatsky. 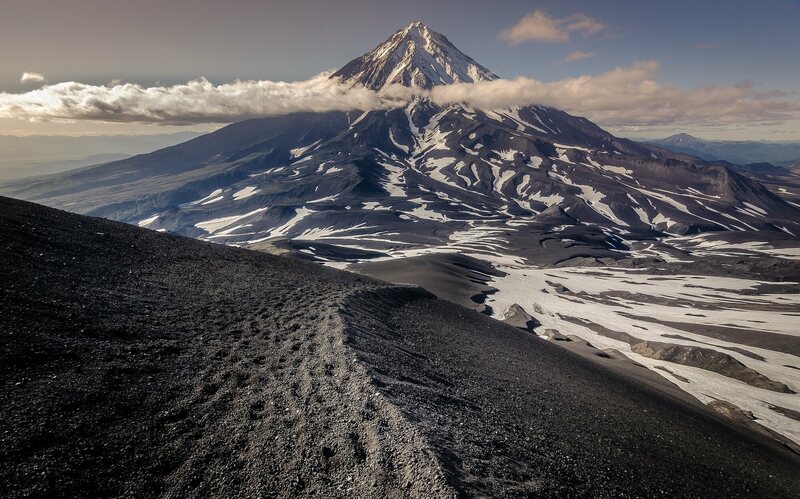 Together with neighbouring Avachinsky, it has been designated a Decade Volcano, worthy of particular study in light of its history of explosive eruptions and proximity to populated areas. Koryaksky lies on the Pacific Ring of Fire, at a point where the Pacific Plate is sliding underneath the Eurasian Plate at about 80 mm/year. A wedge of mantle material lying between the subducting Pacific Plate and the overlying Eurasian Plate is the source of dynamic volcanism over the whole Kamchatka Peninsula. The volcano has probably been active for tens of thousands of years. Geological records indicate that there have been three major eruptions in the last 10,000 years, at 5500 BC, 1950 BC and 1550 BC. These three eruptions seem to have been mainly effusive, generating extensive lava flows. Cape Aya ("the holy one" in Greek, Άγια) is a rocky promontory jutting out into the Black Sea southeast of Balaklava. 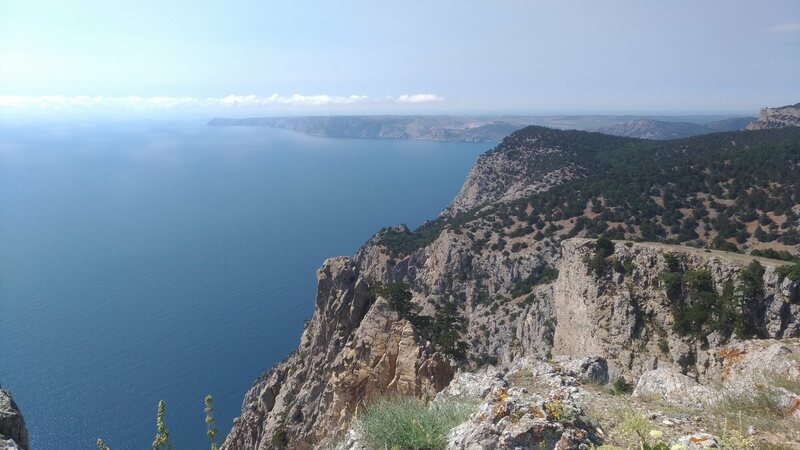 This 13-km-long offspur of the Crimean Mountains separates Laspi Bay (to the east) from Balaklava Bay (to the west). The highest point, Kokiya-Kiya (literally "Blue Cliff") is 559 m (1,834 ft). The headland is full of grottoes; it is protected as a national zakaznik. A storm off Cape Aya is the subject of one of Aivazovsky's paintings. A Soviet guided missile system was located on Cape Aya. 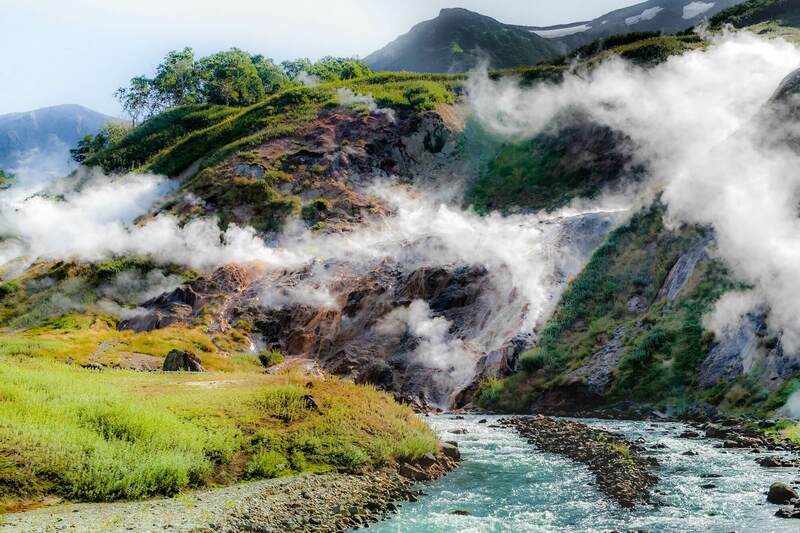 The Valley of Geysers (Russian: Долина гейзеров) is a geyser field on Kamchatka Peninsula, Russia, and has the second largest concentration of geysers in the world. This 6 km (3.7 mi) long basin with approximately ninety geysers and many hot springs is situated on the Kamchatka Peninsula in the Russian Far East, predominantly on the left bank of the ever-deepening Geysernaya River, into which geothermal waters flow from a relatively young stratovolcano, Kikhpinych. Temperatures have been found to be 250 °C, 500 m below the caldera ground. It is part of the Kronotsky Nature Reserve, which, in turn, is incorporated into the World Heritage Site "Volcanoes of Kamchatka". The valley is difficult to reach, with helicopters providing the only feasible means of transport. The "pulsating" geysers of Kamchatka were discovered by a local scientist, Tatyana Ustinova, in 1941. She published her findings fourteen years later, but there was little exploration of the area until 1972. A systematic survey was undertaken in the mid-1970s, and an automatic monitoring system was introduced in 1990. Over thirty geysers were given names; among these was the Giant geyser (Velikan), capable of producing a jet of water reaching up to 40 meters (130 ft). From the 1980s, the area was promoted across the USSR as one of the tourist magnets of Kamchatka and the Russian Far East. Foreign tourists were allowed into the valley in 1991. About 3,000 tourists visited the site annually. On June 3, 2007, a massive mudflow inundated two thirds of the valley.Oleg Mitvol of Russia's Service for the Oversight of Natural Resources said "we witnessed a unique natural event, but the consequences of such a natural catastrophe are irreversible." The World Heritage Site also expressed its deep concern over the issue. "This is tragic for humankind, in that we have lost one of the great natural wonders of the world", the World Wildlife Fund spokesman commented. On June 5, it was reported that a thermal lake was forming above the valley. The landslide occurred while the documentary Wild Russia was filmed; it features footage of before and after the disaster.